If you shop online regularly on the popular Amazon.com website, you’ll be happy to know that they hire people to work from home. Most of their jobs are customer service positions, but they may also hire for other work from home positions. 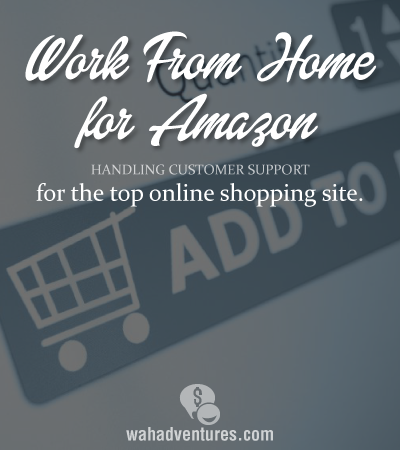 In this post I’ll focus on the work from home customer service positions that Amazon offers. First, it’s important to note that even though this is a work from home position and all the training is done from home, Amazon only hires people who live in certain states – these states are usually Arizona, Kentucky, Texas, West Virginia, Delaware, Florida, Georgia, Kansas, North Carolina, Tennessee and Virginia. They may post work from home jobs in other states though, so it’s important to keep checking their listings if you’re interested in working for them. What will I be doing, and what are the requirements for the position? As a customer service representative for Amazon, you’re responsible for helping people who contact you about different issues or questions about orders. Most people will contact you by phone, but they may also contact you by chat and Skype. Qualifications for the position include at least one year of prior customer service experience, a high school diploma, and you’ll need to be able to pass a background check. Do I have to stick to a fixed schedule? You do have to stick to a schedule, but you can make changes if you need to – occasionally you may be able to do a shift swap with another worker. You can work full-time or part-time, and you’ll also be expected to work at least one weekend day on a regular basis. Training is paid, and it’s done from home via conference calls. Technical requirements to work from home for Amazon include a computer with high-speed Internet access, 5 MB/Sec or higher download speed, a webcam, Windows 7 or 8 64 bit operating system, Windows Auto Update, a dedicated analog phone line, and a distraction-free workspace. How much does Amazon pay per hour? Do they offer benefits? The pay rate for this position depends on the state you live in, but it’s usually at least $10 per hour. Benefits include piad time off, employee discounts, 401(k) and health insurance.